By the end of this year, Microsoft would like you to see a pop-up menu linking all the devices in your home when you switch on your living room television. It has designed a Media Centre-equipped PC which will store digital pictures, home videos, and music, act as a digital video recorder, and play DVDs in a living room friendly package. Microsoft Windows XP Media Centre Edition has been available in the United States since late last year but adapting it to work with European television standards is taking time. The company promises a launch in the UK, Germany and France this year. The system responds to a remote control fitted with the inevitable Start button, though it will work with a wireless keyboard and mouse too. The PCs demonstrated at the CeBIT technology fair in Hanover still looked like PCs, and indeed they are. Media Centre Edition is a superset of Windows XP Professional and as such allows the user to install their own software as normal and to integrate third party add-ons to the Media Centre interface. The Windows Media Player can be replaced by Real Networks' Real One player, for instance. Microsoft Windows eHome Marketing Manager Jodie Cadieux told BBC News Online that Microsoft had initially thought that the system would sell well to technology enthusiasts. In actual fact it is selling best in the US to consumers attracted by ease of use. "Consumers do not care where the content is, they just want it," she said. "The remote control is going to be as integral to the PC in five years as it is to the TV now." Microsoft hopes that Media Centre-equipped PCs on the European market will cost no more than similarly specified PCs running Windows XP. They will not be bottom-of-the-range machines, though, as they will need large hard drives to store video. The model Microsoft demonstrated at CeBIT had a 200 GB hard drive. 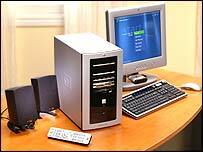 The computers also need extras like an infrared receiver for the remote control and a TV tuner to receive the television picture.